Go for the Bronze! These Bronze 2-Tier Round Willow Display Baskets are an exquisite way to show off your merchandise. The glimmer of bronze on these baskets will attract extra customer attention and increase sales. This willow basket display is great for your produce, candy, accessories, and more. 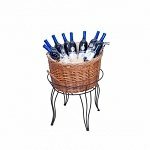 This basket display would look phenomenal with small bottles of skin care products in your spa or beauty salon. 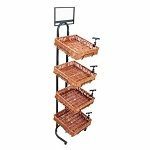 The two-tier design allows you to make use of vertically any space. Order today!